Rethinking Faith and Church: Do You Have A Personal Church Story To Tell? I am pleased and excited to announce that I have been asked if I would like to contribute to an interesting book project. My answer is an unequivocal, "Yes." 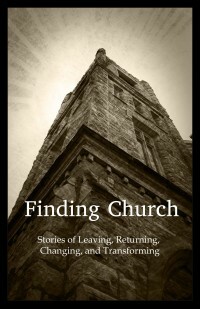 The working title of the book is "Finding Church: Stories of Leaving, Returning, Changing, and Transforming." Doesn't that title just grab your attention and make you want to know more? I think so. The book is going to be a collection of stories from various people on their personal experiences with the church. This promises to be interesting precisely because they are, in fact, “personal” stories and not simply more divisive theological debates. And who doesn't love stories? We all do, right? We all have different ideas about what it means to "be" the church or "go" to church, as evidenced by our current spiritual paths. Unfortunately, along with those ideas often comes a great deal of misunderstanding and distrust of each other as brothers and sisters. This need not be. Maybe I’m being utopian, but perhaps the telling of some of these personal stories will actually lead to fewer “dissentions and factions” (Galatians 5:20) in the church. Who knows? Why do some people leave the church? Why do others who have once upon a time left the church feel drawn to return to church? Likewise, I have met some people who feel that it is possible to better reform the church from the inside rather than from the outside, and wondered why. In short, what is it that has brought each of us to the place where we are today in our spiritual walks? Interesting questions. The way I see this project is almost like a collection of autobiographies, and I love a good biography. There are a lot of interesting people out there with interesting stories to tell. I am looking forward to curling up in my favourite chair with my copy of Finding Church. The project is the brainchild of my friend Jeremy Myers in conjunction with Civitas Press. As Jeremy said, “If you have a story to tell, and would like to get your story into print, you are invited to participate.” So, do you have a story to tell? If so, here’s your chance. For more details, please visit Jeremy’s blog “Till He Comes.” I’m sure that he would love to hear from you. Thanks, David. I'm excited about it. Great I am an avid reader of both of your blogs. I am honoured. Thank you for that.